Dionne Yvette Farris (born December 4, 1969) is an American, singer, songwriter, producer and actress. Born and raised in New Jersey, she began singing in elementary school and competed in pageants as a teenager. In the early 1990s, she was featured on the hip hop group Arrested Development (1992) hit single "Tennessee". Farris rose to fame with the release of her debut album, Wild Seed - Wild Flower (1994) on Columbia Records. The album featured the Top 40 single, "I Know" (1995). That same year, the video earned Farris the Billboard Music Video Awards Best Pop/Rock New Artist Clip of the Year. She was nominated for the Grammy Award for Best Female Pop Vocal Performance (1996). Farris was born in Plainfield, New Jersey, United States, the daughter of Larraine (Wall) and Richard Farris, both of who had musical talents and aspirations, and named Dionne for their favorite singer, Dionne Warwick. Farris was raised in Bordentown, New Jersey by her single mother, whose side of the family introduced her to the musical acts that shaped and influenced her as an artist. Farris was a huge Diana Ross fan as a child — one of Farris’ fondest memories was attending a Ross concert in Manhattan at the age of eight, being lifted by her uncle onstage, and getting kissed by the superstar. Farris began taking dance lessons at the age of three at Irene Parker Dance Studio, Hamilton Township, New Jersey. She danced ballet, jazz, tap, and toe for ten years, opting at thirteen to sing instead. Aside from singing in church, Farris was first exposed to music performance as a third-grader at Peter Muschal Elementary School (Bordentown, New Jersey), when she was selected as one of two students to join a regional children’s choir being created. In middle school, Farris was part of the New Jersey Singers’ Choir under the direction of Gary Farquhar, where they performed classical works, (Carmina Burana), Broadway (Cats (musical)), and choral music. Her first solo performance outside of school was at the age of twelve, when she sang an a cappella rendition of “Good Morning Heartache” by Billie Holiday after watching the movie Lady Sings the Blues and getting Holiday's records from the public library. She sang in her high school’s choir and starred in the then controversial lead role of the high school’s production of Annie, in her senior year. The drama teacher stated that some in the community were not happy that Farris had the role, because she was black. After graduating from Bordentown Regional High in 1987, Farris attended Mercer County Community College, where she studied photography. Farris entered into the Miss Hemisphere Pageant regional competitions, directly after high school and won her first and only pageant as 1987's Miss Hemisphere's Adult Talent, singing Whitney Houston's Saving All My Love for You in Miami, Florida. But it was music that really drew Farris, and she joined a band in Plainfield, New Jersey, known as 2.0 and later as Breaking Ground. They began performing on the Manhattan’s club circuit, and looked to sign a record deal. Farris decided to move to Atlanta with her then boyfriend Donald "Rasa Don" Jones (one of the earlier members of Arrested Development), where her father lived, to try to establish herself in the then-nascent African American cultural renaissance that was building in that Southern city. After a short while Farris hooked up with then-wunderkind Atlanta producer Jermaine Dupri and began writing songs for Atlanta-based acts such as TLC and singing backgrounds for acts such as Xscape, and El Debarge. She signed a management contract with Michael Mauldin's (father of Dupri) company as a solo artist, but would later become a member of a girl group they were producing, known as Onyx (a name later co-opted by a semi-gangsta rap group). Farris and Arrested Development were signed to the same management company. The group wanted a female singer for their 3 Years, 5 Months & 2 Days in the Life Of... album and Farris, although she was not interested in being in the group, agreed to sing with them and became an unofficial "extended family" member. Farris sang on 3 songs with the group, "Fishin' 4 Religion", "Give a Man a Fish" and "Tennessee". Farris performed the song with Arrested Development on the 1992 MTV Movie Awards, The Arsenio Hall Show and went on the group's first national tour. After the success of “Tennessee”, she began to receive media attention, and Chrysalis, (Arrested Development’s then label) A&R Duff Marlo offered Farris a solo deal, contingent upon Speech producing the project, but she rejected the offer in search of a deal where she would have artistic control. Farris began experiencing personal and business conflicts with the group’s leader, despite the success of “Tennessee” (the band’s first and biggest hit in 1992). Farris was never an official member of the band, and she left the group altogether in Atlanta in September, 1992, before a show, at the Fox Theater, after having a fight with Speech and co-leader Headliner. Farris reached out to Milton Davis and David Harris and began a collaboration. A demo sent to Sony Music was first reviewed by Bobby Colomby, then by the A&R, Randy Jackson (who subsequently became known as a judge on American Idol). Jackson signed Farris to a deal at Columbia Records. Her debut album, Wild Seed – Wild Flower (1994), featured the 1995 hit single "I Know", which reached number four on the Billboard Hot 100 and was nominated for the Grammy Award for Best Female Pop Vocal Performance in 1996. In the UK Singles Chart, "I Know" peaked (after a re-release) at #41 in May 1995. Wild Seed – Wild Flower reached #57 on the Billboard 200 chart. Radio & Records magazine ranked "I Know" as the number-one most played song on mainstream Top 40/CHR radio stations for 1995 and spent 10 consecutive weeks at #1 on the Mainstream Top 40 chart (April 1-June 3, 1995). On April 8, 1995, she was the musical guest on Saturday Night Live, performing "I Know" and a roots acoustic rendition of the Beatles song "Blackbird." That same year (1995), her version of Billy Taylor's "I Wish I Knew How It Would Feel To Be Free" appeared on the soundtrack to the documentary The Promised Land. It would appear again as the opening song to the (1996) Rob Reiner film Ghosts of Mississippi, about the true story of the 1994 trial of Byron De La Beckwith, the white supremacist accused of the 1963 assassination of civil rights activist of Medgar Evers. Farris' soundtrack work continued for another 1996 film, The Truth About Cats & Dogs, to which she contributed a version of the Stevie Wonder classic "For Once in My Life" as the closing song and the (1996) film First Wives Club with a rendition of Bill Withers' "Heartbreak Road". In 1997, she had another single called "Hopeless" (written by Van Hunt) from the Love Jones soundtrack. 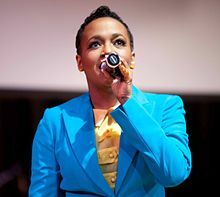 Farris recorded a second album For Truth If Not Love with Columbia, but she and the label would part ways before the project was released. It would later be released in 2007, issued on iTunes. It featured the track "Stuck in the Middle". Farris released her official follow-up album Signs of Life in (2011), named Top 10 soul albums of 2011, a mixtape Lady Dy, the Mixtape Pt 1 (2011) and a live jazz album Dionne Get Your Gunn: Featuring the Russell Gunn Quartet with Dionne Farris (2012) via PledgeMusic crowd funding on her own record label, Free & Clear Records. ^ "The Hottest New Female Singers". Jet Magazine. Johnson Publishing Company. 29 May 1995. p. 61. Retrieved 7 September 2013. ^ Wikane, Christian John. "Have Fun: A Tribute to Diana Ross, Nile Rodgers, and the CHIC Groove of 'diana' (Parts 1-4)". PopMatters. PopMatters. Retrieved 7 September 2013. ^ a b c d e Carter, Kevin L. "What New in Princeton & Central New Jersey?". US 1 newspaper. prinstoninfocom. Retrieved 8 September 2013. ^ Garcia, Bobbito. "Dionne Farris States The Facts". Vibe Magazine. Vibe Magazine. p. 40. Retrieved 8 September 2013. ^ "Speech Interview". Songfacts. Retrieved April 3, 2008. ^ a b c "Biography by Steve Huey". Allmusic.com. Retrieved 4 January 2009. ^ Roberts, David (2006). British Hit Singles & Albums (19th ed.). London: Guinness World Records Limited. p. 195. ISBN 1-904994-10-5. ^ Hargro, Carlton (December 11, 2011). "Top 10 Soul Albums of 2011". Cribnotes Powered by the Tabernacle. Creative Loafing Atlanta. Retrieved 13 September 2013. This page was last edited on 20 February 2019, at 15:09 (UTC).